The New Mexico History Museum will use the artifacts and stories of the State's past in order to present exhibitions and educational programs that inspire and enrich the visitors' knowledge, understanding and appreciation for the rich history and diverse cultures of New Mexico. The new museum building, the Fray Angelico Chavez History Library and the Palace of the Governors historic site form a downtown cultural complex and visitor experience known as the New Mexico History Museum, one of the most important cultural assets of the State. The new museum will provide state of the art facilities to preserve, exhibit and interpret New Mexico's rich and diverse historical legacy. For more information about the history museum please download the New Mexico History Museum concept book from the Palace of the Governors website, http://palaceofthegovernors.org/. 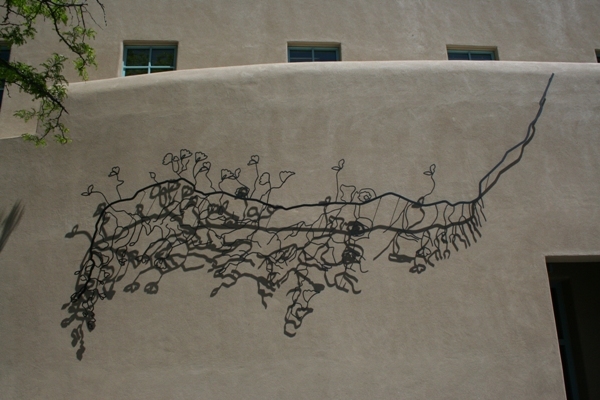 The Local Selection Committee intent was to commission a timeless, highly visual original artwork that would enhance the visitors’ experience to the museum while addressing the unique connection that exists in New Mexico between its people and place. Paula Castillo from Cordova, New Mexico was selected to create the artwork. The piece was installed in April of 2009.